Humanity has declined. The last known colony of humans lives in a walled fortress, hiding from the monsters without. Very little is known about this new predator. They range in height, several meters tall, towering above buildings, and able to pick up humans like plaything. They look eerily like humans, but without any intelligence in their eyes. For a hundred years, humankind has hidden behind these walls. Almost all information of the world before the Titans appeared has been destroyed, and it's taboo to talk about the would outside of this last garrison. But for Eren Yeager, and his friends Mikasa and Armin, that's not good enough. Eren wants to enter the military when he's older. Not the Garrison that patrol the walls, or the Military Police, who protect the elite within the innermost walls. Eren wants to be part of the Survey Corps. For Eren isn't content living within this last bit of safety. He wants to help study the Titans, find out where they come from and how they work, and eventually reclaim the rest of the world on behalf of humankind. His mother reacts with the same horror one would expect from a parent whose child told them that they want to risk their life in a branch of the military with an 80% casualty rate. She forbids Eren from joining, but his father remains oddly quiet about the whole situation. He simply says that when he returns from his trip, he'll show Eren what he's been hiding in their locked basement all these years. As Eren and Mikasa join Armin in town, however, the unthinkable happens. After a century of safety, a Colossal Titan appears, tall enough to see over the 50meter walls surrounding their village. And as he decimates the complacent wall guards and destroys the outer wall, another Aberrant Titan charges through the inner gate, allowing normal Titans to flood into Wall Maria. Homes are destroyed, countless children are made orphans, and Wall Maria is abandoned as refugees flood Wall Rose. Eren is going to destroy the Titans. 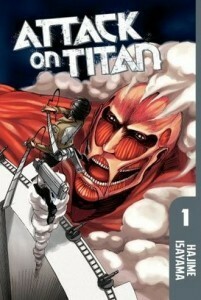 A sleeper hit in manga form, the popularity of Attack on Titan has skyrocketed during the first season of the anime. The anime closely follows the manga, and while it's not strictly necessary to read the book after watching the show, fans of the series will enjoy another way to experience this compelling, horror manga. Highs: The faces of the Titans are terribly unnerving, adding to the creepy air of the series as a whole. Lows: Fans looking for more insight into the characters may be disappointed, as some scenes are panel-by-panel recreated in the anime. Verdict: Every manga and anime fan should check this series out, in one format or another.